Truck drivers and warehouse workers protested alleged unfair labor practices at the nation’s largest port complex on Thursday, claiming they are misclassified as independent contractors and denied employee benefits. Drivers who work at the Southern California complex, which is made up of the ports of Los Angeles and Long Beach, also are protesting a plan that would force truckers to require zero-emission trucks and yard equipment by 2035. Workers are gearing up for a strike scheduled to start Monday at various trucking companies and warehouses at the port complex. Those companies include California Cartage Co., California Cartage Express, Intermodal Bridge Transport, or IBT, and XPO Logistics. Company representatives for XPO and IBT said they were aware of the impending strike, but had no comment. The company said that since the drivers signed the independent contractor agreements, they are not entitled to recover business expenses under the California Labor Code, which only applies to company employees. The misclassification issue has turned into a bitter legal fight that pits drivers against trucking companies and is being played out on picket lines and in courtrooms. Monday’s strike will be the 15th at the Southern California ports in the past four years. Truckers have filed more than 800 employee misclassification wage claims since 2011 and have been awarded about $40 million over 300 cases, according to the California Labor Commissioner’s office. About 200 cases are still pending, according to the state agency. “It’s astonishing to me that every case we’ve had against these companies we’ve won and some for millions of dollars, but they continue to engage in these illegal practices,” Eric Tate, spokesman for the Teamsters, told Trucks.com. 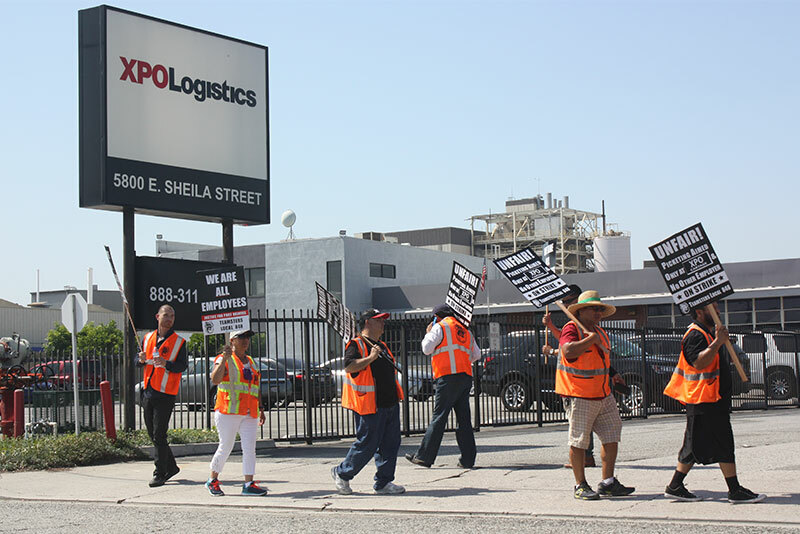 A federal court recently upheld a California Labor Commissioner’s decision and awarded a nearly $1 million judgement to five XPO Cartage port drivers, who were misclassified as independent contractors. In a separate case, four drivers for the company were also awarded more than $855,000 because of the same issue. 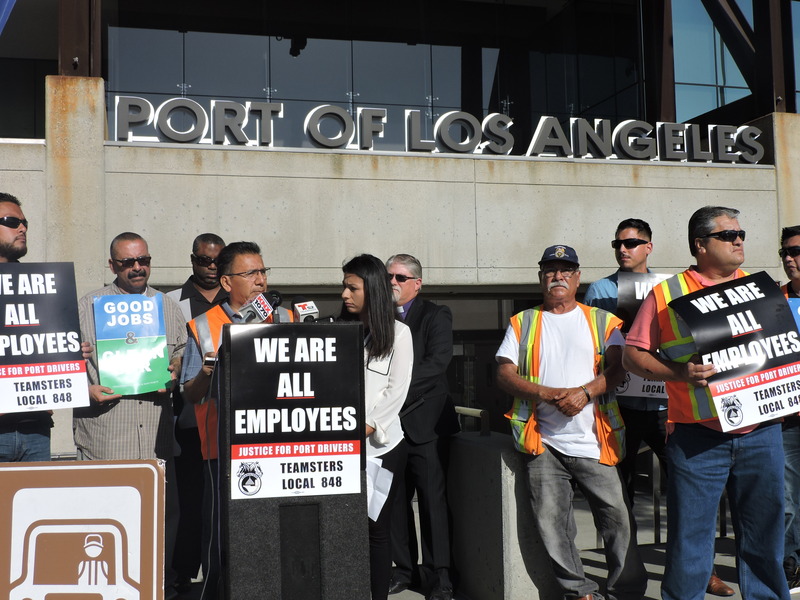 “I stand with the drivers demanding fair and legal treatment and fair pay for the work they do and the service they provide,” said Los Angeles Councilmember Joe Buscaino, who has many of the union and port employees in his district. “I take allegations of unfair labor practices and poor working conditions very seriously and urge the Port and Harbor Commission to urgently address these serious claims,” Buscaino told Trucks.com. Port drivers claim they are being denied employee benefits including wages, overtime pay, unemployment insurance and workers’ compensation by being classified as independent contractors rather than employees. Some said they have been forced to sign predatory lease-purchase contracts for trucks in order to work for the trucking companies, and that there is little, if any, money left over in their paychecks after rent, insurance, fuel and other maintenance fees are deducted. Tracy Ellis, who now works as a union port driver for Shippers Transport Express, said she and others at her company will go on strike Monday to support her fellow drivers at the ports. “The fight has been a long hard road, but we will continue fighting, continue striking and will not rest until every single driver has the same rights that I do as a union port driver,” Ellis said at a press conference on Thursday. Port workers are also protesting a recent announcement by Los Angeles Mayor Eric Garcetti and Long Beach Mayor Robert Garcia to require zero-emission trucks and yard equipment at the ports of Los Angeles and Long Beach by 2035. The mayors have agreed to make the transition to zero emissions at the ports as part of their Clean Air Action Plan, or CAAP. 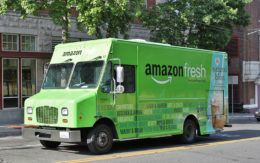 Their plan includes launching a zero-emissions drayage truck pilot program. Officials from both ports are expected to issue a detailed timeline and process for CAAP later this month. Nearly 40 percent of all container cargo in the U.S. is moved through the port complex, which generates around $400 billion of economic activity each year. More than 15,000 truck drivers and warehouse employees work at the ports. 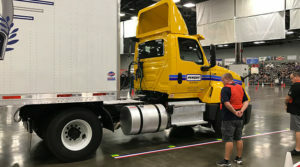 Drivers are concerned about who will pay for the costly, cleaner trucks to meet the mayors’ zero emissions goal, said Barb Maynard, spokeswoman for the Teamsters union. Some port drivers are still trying to climb their way out of bad lease-purchase deals they made with drayage companies as part of the first Clean Truck Program back in 2008 as few could obtain outright loans for the pricey trucks, she said. Shipping companies, not truck drivers, should bear the cost of the new truck technology, aimed at curbing emissions at the ports, Tate said. “I know we need those goods that come in, but there is no way the weight should be placed on the backs of those who make the least amount of money – the workers,” he told Trucks.com. Hopefully it will spread over to the east coast. Savannah Charleston new York. It’s unbelievable that those drivers running 20 Hours a day,for next to nothing,dragging overweight loads destroying (Georgia roads),.yeah come on Let’s strike!!!!!! It’s all about screwing the Drivers over because these Greedy Corporate Giants know they can get away with it.